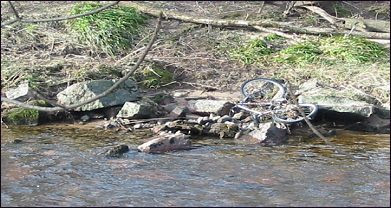 A Gurn from Nurn: The River Nairn the awful truth – wild bike infestation. 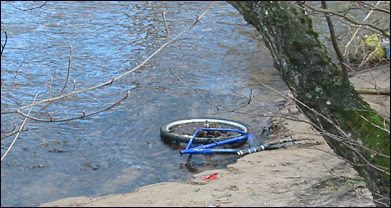 The River Nairn the awful truth – wild bike infestation. The Gurn realises how the admission that we have wild bikes nesting on the River Nairn could damage the town’s economy but we feel that we have to act before things get much worse The Gurn was very lucky to get pictures of the wild bikes, they are notoriously shy close to human beings but they can be very dangerous if cornered. We were lucky that the wild bikes came out of their burrows to enjoy the February sunshine, experts state they only do this during the short mating season. .
We call on our local representatives to deal with this menace. We realise that the local authority doesn’t have the expertise or the finances to deal with this situation so we call upon the Scottish Government to act. Help our community before it is too late! Take a good look at these pictures and be alarmed! Was the Lesser Blue a male or female? From the picture of the lesser blue it is clearly a male. I hate to have to do this but another regular visitor has been reported lurking about the undergrowth, I won't disclose what it is yet as I want to be absolutely sure and will try and get a visual on it! If it is what I think it is, it is displaying peculiar behaviour as it usually migrates down river, not up as this one is reportedly doing.